Last week, VMware announced App Volumes 3.0. It was a taste of the bigger announcements to come in today’s Digital Enterprise event. And they have a huge announcement. Just a few short months after unveiling Horizon 6.2, VMware has managed to put together another major Horizon release. Horizon 7.0 brings some significant enhancements and new features to the end-user computing space, including one long awaiting feature. Before I talk about the new features, I highly recommend that you register for VMware’s Digital Enterprise event if you have not done so yet. They will be covering a lot of the features of the new Horizon Suite offerings in the webinar. You can register are http://www.vmware.com/digitalenterprise?src=sc_569fec388f2c9&cid=70134000000Nz2D. So without further ado, let’s talk about Horizon 7’s new features. Instant Clones were debutted during the Day 2 Keynote at VMworld 2014. After receiving a lot of hype as the future of desktop provisioning, they kind of faded into the background for a while. I’m pleased to announce that Horizon 7 will feature Instant Clones as a new desktop provisioning method. Instant Clones utilize VMware’s vmFork technology to rapidly provision desktop virtual machines from a running and quiesced parent virtual desktop. Instant clones share both the memory and the disk of the parent virtual machine, and this technology can provide customized and domain joined desktops quickly as they are needed. These desktops are destroyed when the user logs off, and if a new desktop is needed, it will be cloned from the parent when requested by a user. Instant clones also enable administrators to create elastic pools that can expand or shrink the number of available desktops based on demand. Simplified Administration – No need to perform refresh or recompose operations to maintain desktops. Although instant clones were not available as a feature in Horizon 6.2, it was possible to test out some of the concepts behind the technology using the PowerCLI extensions fling. Although I can’t validate all of the points above, my experiences after playing with the fling show that provisioning is significantly faster and boot storms are avoided. Floating desktop pools only. No support for dedicated assignment pools. Limited 3D support – no support for vGPU or vDGA, limited support for sVGA. VSAN or VMFS datastores only. NFS is not supported. Desktop personalization for instant clones is handled using App Volumes User Writable drives and UEM. VMware introduced HTML5 desktop access using the Blast protocol in Horizon 5.2 back in 2013. This provided another method for accessing virtual desktops and, later, published applications. But it had a few deficiencies as well – it used port 8443, was feature limited compared to PCoIP, and was not very bandwidth efficient. The latest version of Horizon adds a new protocol for desktop access – Blast Extreme. Blast Extreme is a new protocol that is built to provide better multimedia experiences while using less bandwidth to deliver the content. It is optimized for mobile devices and can provide better battery life compared to the existing Horizon protocols. 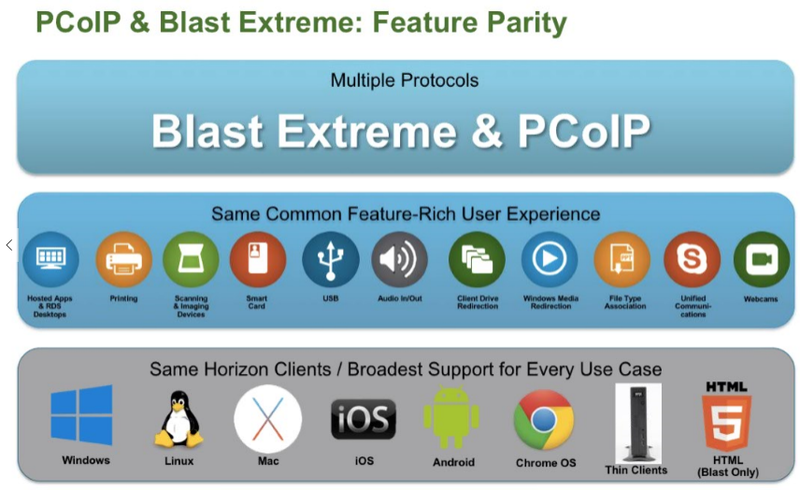 Most importantly, Blast Extreme has feature parity with PCoIP. It supports all of the options and features available today including client drive redirection, USB, unified communications, and local printing. Unlike the original Blast, Blast Extreme is not strictly a web-only protocol. It can be used with the new Windows, MacOS, Linux and mobile device clients, and it works over port the standard HTTPS port. This simplifies access and allows users to access it in many locations where ports 8443 and 8172 are blocked. What if your use case calls for disabling copy and paste or local printing when uses log in from home? Or what if you want to apply a different PCoIP profile based on the branch office users are connecting to? In previous versions of Horizon, this would require a different pool for each use case with configurations handled either in the base image or Group Policy. This could be cumbersome to set up and administer. Horizon 7 introduces Smart Policies. Smart policies utilize the UEM console to create a set of policies to control the desktop behavior based on a number of factors including the groups that the user is a member of and location, and they are evaluated and applied whenever a user logs in or reconnects. Smart policies can control a number of capabilities of the desktop including client drive redirection, Clipboard redirection, and printing, and they can also control or restrict which applications can be run. Horizon 6.1 introduced vGPU and improved the support for workloads that require 3D acceleration. vGPU is limited, however, to NVIDIA GRID GPUs. Horizon 7 includes expanded support for 3D graphics acceleration, and customers are no longer restricted to NVIDIA. AMD S7150 series cards are supported in a multi-user vDGA configuration that appears to be very similar to vGPU. Intel Iris Pro GPUs are also supported for vDGA on a 1:1 basis. Cloud Pod Architecture has been expanded to support 10 Horizon pods in four sites. This enables up to 50,000 user sessions. Entitlement support has also been expanded – home site assignment can be set for nested AD security groups. Other enhancements include improved failover support to automatically redirect users to available resources in other sites if they are not available in the preferred site and full integration with vIDM. Unified Management Console for App Volumes, UEM, and monitoring. The new management console also includes a REST API to support automating management tasks. A new SSO service that integrates vIDM, Horizon, Active Directory, and a certificate authority. Improvements to the Access Point appliance. 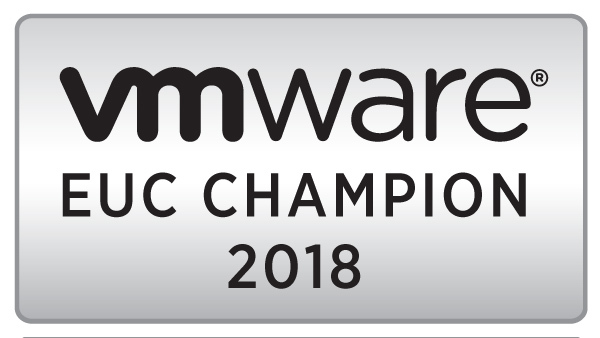 Horizon 7 provides another leap in Horizon’s capabilities, and VMware continues to reach parity or exceed the feature sets of their competition. Back in October of 2014, I wrote a post about the (then) current state of my home lab. My lab has grown a lot since then, and I’ve started building a strategy around my lab to cover technologies that I wanted to learn and the capabilities I would need to accomplish those learning goals. I’ve also had some rather spectacular failures in the last year. Some of these failures have been actual lab failures that have impacted the rest of the home network. Others have been buying failures – equipment that appeared to meet my needs and was extremely cheap but ended up having extra costs that made it unsuitable in the long run. I’ve never really had a strategy when it comes to my home lab. Purchasing new hardware happened when I either outgrew something and needed capacity or to replace broken equipment. If I could repurpose it, an older device would be “promoted” from running an actual workload to providing storage or some other dedicated service. But this became unsustainable when I switched over to a consulting role. There were too many things I needed, or wanted, to learn and try out that would require additional capacity. My lab also had a mishmash of equipment, and I wanted to standardize on specific models. This has two benefits – I can easily ensure that I have a standard set of capabilities across all components of the lab and it simplifies both upgrades and management. The other challenge I wanted to address as I developed a strategy was separating out the “home network” from the lab. While there would still be some overlap, such as wireless and Internet access, it was possible to take down my entire network when I had issues in my home lab. This actually happened on one occassion last August when the vDS in my lab corrupted itself and brought everything down. End-User Computing: I already use my lab for the VMware Horizon Suite. I want to expand my VDI knowledge to include Citrix. I also want to spend time on persona management and application layering technologies like Liquidware Labs, Norskale, and Unidesk. Automation: I want to extend my skillset to include automation. Although I have vRO deployed in my lab, I have never touched things like vRealize Automation and Puppet. I also want to spend more time on PowerShell DSC and integrating it into vRO/vRA. Another area I want to dive back into is automating Horizon environments – I haven’t really touched this subject since 2013. Containers: I want to learn more about Docker and the technologies surrounding it including Kubernetes, Swarm, and other technology in this stack. This is the future of IT. Nutanix: Nutanix has a community edition that provides their hyperconverged storage technology along with the Acropolis Hypervisor. I want to have a single-node Nutanix CE cluster up and running so I can dive deeper into their APIs and experiment with their upcoming Citrix integration. At some point, I will probably expand that cluster to three node and use it for a home “private cloud” that my kids can deploy Minecraft servers into. Remote Power Management: This is the most important factor when it comes to my compute nodes. I don’t want to have them running 24×7. But at the same time, I don’t want to have to call up my wife and have her turn things on when I’m traveling. Servers that I buy need to have some sort of remote management capability that does not require an external IP KVM or Wake-on-LAN. The compute nodes I use need to have some sort of integrated remote management, preferably one with an API. Redundancy: I’m trying to avoid single-points of failure whenever possible. Since much of my equipment is off-lease or used, I want to make sure that a single failure doesn’t take everything down. I don’t have redundancy on all components – my storage, for instance, is a single Synology device due to budget constraints. Network and Compute, however, are redundant. Future lab roadmaps will address storage redundancy through hyperconverged offerings like ScaleIO and Nutanix CE. Flexibility: My lab needs to be able to shift between a number of different technologies. I need to be able to jump from EUC to Cloud to containers without having to tear things down and rebuild them. While my lab is virtualized, I will need to have the capacity to build and maintain these environments in a powered-off state. Segregation: A failure in the lab should not impact key home network services such as wireless and Internet access. Aside from one exception, I’ve standardized my compute tier on Dell 11th Generation servers. I went with these particular servers because there are a number of off-lease boxes on eBay, and you can usually find a good deals on servers that come with large amounts of RAM. RAM prices are also fairly low, and other components like iDRACs are readily available. The Management cluster consists of two PowerEdge R310s. These servers have a single Xeon X3430 processor and 24GB of RAM. This cluster is not built yet because I’ve had some trouble locating compatible RAM – the fairly common 2Rx4 DIMMs do not work with this server. I think I’ve found some 2Rx8 or 4Rx8 DIMMs that should work. The management cluster uses standard switches, and each host has a standard switch for Storage and a standard switch for all other traffic. The Workload cluster consists of two PowerEdge R710s. These servers have a pair of Xeon E5520 processors and 96GB of RAM. My original plan was to upgrade each host to 72GB of RAM, but I had a bunch of 8GB DIMMs from my failed R310 upgrades, and I didn’t want to pay return shipping or restocking fees. The Workload cluster is configured with a virtual distributed switch for storage, a vDS for VM traffic, and a standard switch for management and vMotion traffic. The vGPU cluster is the only cluster that doesn’t follow the hardware standards. The server is a Dell PowerEdge R730 with 32GB of RAM. The server is configured with the Dell GPU enablement kit and currently has an NVIDIA GRID K1 card installed. My Nutanix CE box is a PowerEdge R610 with 32GB of RAM. The storage tier of my lab consists of a single Synology Diskstation 1515+. It has four 2 TB WD Red drives in a RAID 10 and a single SSD acting as a read cache. A single 2TB datastore is presented to my ESXi hosts using NFS. The Synology also has a couple of CIFS shares for things like user profiles and network file shares. The network tier consists of a Juniper SRX100 firewall and a pair of Linksys SRW2048 switches. The switches are not stacked but have similar configurations for redundancy. Each server and the Synology are connected into both fabrics. I have multiple VLANs on my network to segregate different types of traffic. Storage, vMotion, and management traffic are all on their own VLANs. Other VLANs are dedicated to different types of VM traffic. That’s the overall high-level view of the current state of my home lab. One component I haven’t spent much time on so far is my Horizon design. I will cover that indepth in an upcoming post.